The live set from Clap! Clap! (aka Cristiano Crisci) last night (August 22) was a percussion-heavy romp backed by visuals of dancing elephants, crocodiles, sloths and pineapples wearing sunglasses. 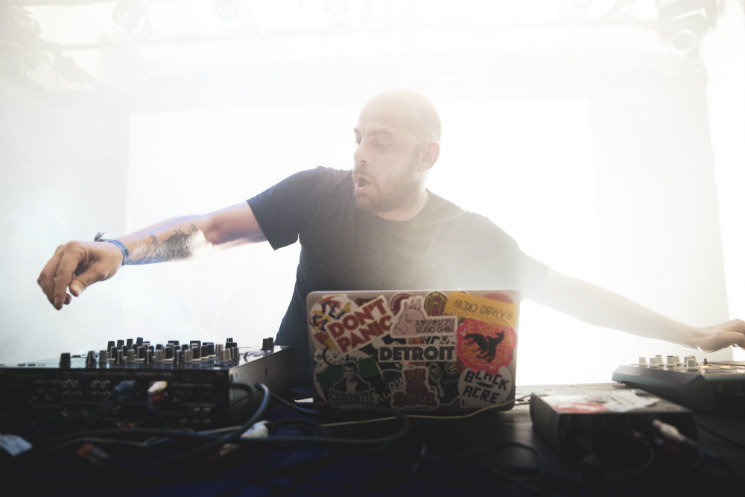 He blended a plethora of world music into his own, jacked-up beats: the techno was layered with African drums, the house was underpinned by Indian flavour, and the instrumental hip-hop was strewn with Latin flair — and filthy bass, we might add. Yet, for all the impressive genre-bending on hand, it was Crisci himself that was the most entertaining aspect. Plenty of producers move around when they're playing, but Clap! Clap! was flailing like a madman up there. He was so energetic that he was almost a show unto himself, with the music riding shotgun. With so much movement, it was easy to forget that this was still a live set, but he reminded us every once in a while with some quick-fire hammering of his Akai MPD32, connected to Reason. It seems as if this was all new material from the Italian producer, but some little sampling nuggets slipped in — one that sounded a lot like "Shumba" by Thomas Mapfumo, more famously remixed by Daphni, and the vocals from Dead Prez's classic "Hip Hop." And did we mention that there were plenty of clap sounds? Because there were.